There are some advantages to running a race more than once. At least you know what you’re in for. You know every twist and turn of the course. You know how to train for it. You know your strategy by heart. 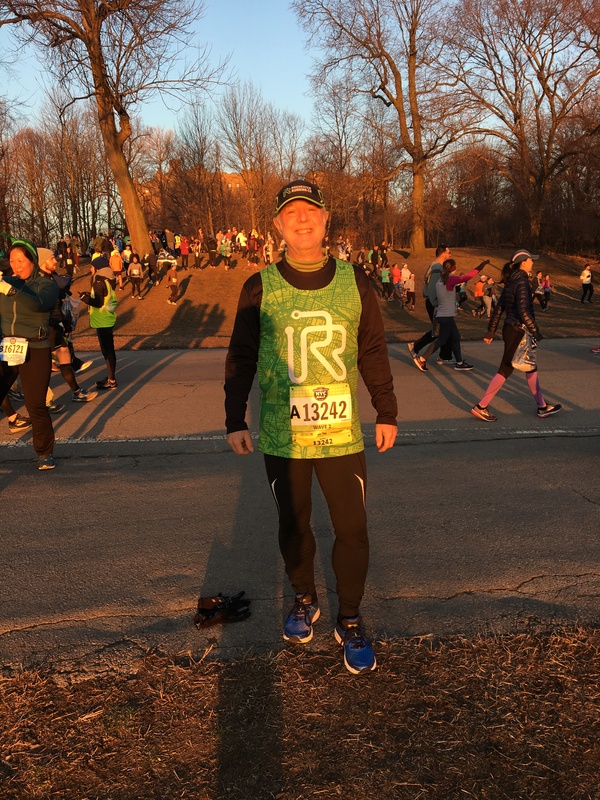 But repeat appearances also have their share of problems, and my second New York City Half Marathon was a combination of both. On the one hand, my training and pre-race prep was pretty much the same as before. And while my mileage in the weeks prior was slightly lower than it had been a year earlier, I had run some fast times that suggested I would do about as well as I had done in 2018. On the other hand, the New York Road Runners had changed the course slightly, altering the first and last miles enough to make the race slightly different to the one we had experienced before. A new start line configuration in Prospect Park meant a different subway ride to get there (though there was no change in the stupid-o’clock alarm call needed to get me there on time). It also meant we had to run some small yet significant hills right from the outset. 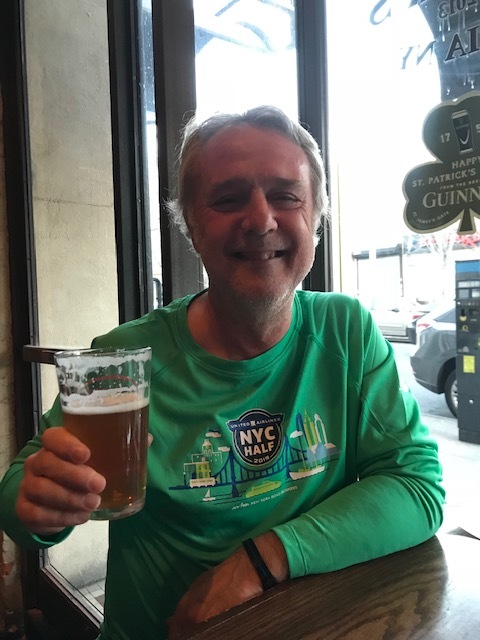 But those losses looked like being offset by a different route through Central Park, which lopped off Cat Hill and the Three Sisters rollers, taking out the energy-sapping elevations at the end and potentially leading to an easier and faster run to the finish line. In the end, though, it was a race. And that meant unpredictability no matter whether things were the same or different from the last time. It was also a New York race. And that meant New York moments. 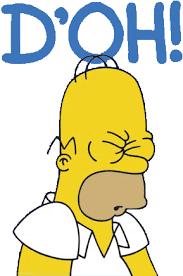 And a couple of “D’oh!” moments from me thrown in for good measure. The New York moments began right away, on the Prospect Park subway station, as a guy in sunglasses, a 70s pink fuzzy disco bomber jacket, and red sequined pants pirouetted along the subway platform without a care in the world in front of the hundreds of runners disembarking from the train. They continued immediately with a gentleman urinating in his pants, oblivious to the telltale line of pee that was rapidly spreading out onto the platform under the feet of the crowds around him headed to the stairs. Yep. As if my sleep-deprived brain needed the reminder, the evidence that I was in New York City was inescapable. I followed the crowds on the long route march to the start corrals, mentally cursing the New York Road Runners for always having us walk miles to the start lines — and miles from the finish lines to the reunion areas — of all their races. The only bright spot (and, boy, was it ever bright) was the sun, which kept the temperature higher than 2018’s frozen beginning. Finally, after warmups and a pee (out of everyone’s sight, of course), I started to locate my assigned corral. Only, there was no signage. And the gates leading into the start chute, where I thought we were supposed to enter, were locked. 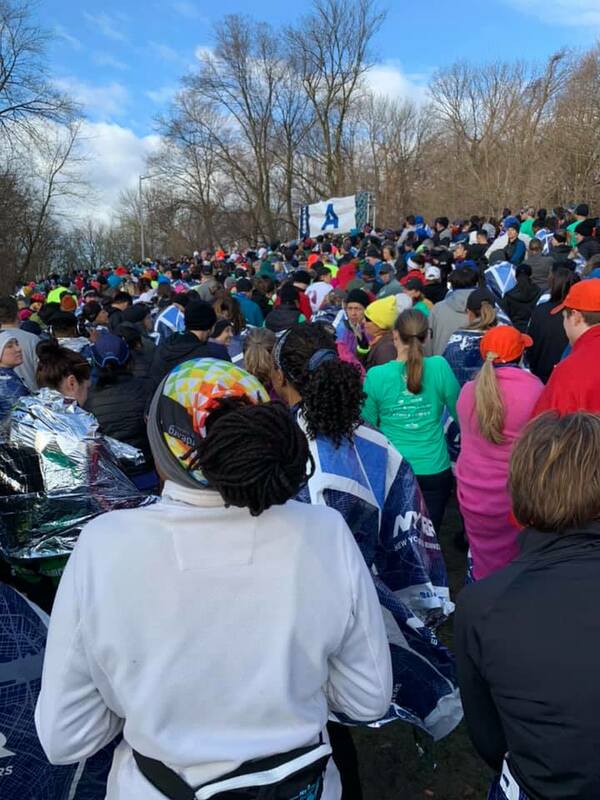 I walked along the fence, further and further away from the start line, only to finally be met by the site of hundreds of runners all trying to move up a hill toward a ten-foot entry point. It was, as an old boss of mine used to say, like a snake trying to swallow a football. All the time, runners trying to enter other corrals were walking through the crowd waiting to get into the A corral, impeding our progress. It was, quite simply, one of the most chaotic starts to a race I have ever experienced. … where there were no volunteers there to check bibs. But a glance to my left told me that was the least of my concerns at that point. There, the mass of runners in B corral were waiting to be unleashed. Not wanting to get caught up in the crowds, I opted to start my run a few hundred yards before the start line. It was the right decision — I crossed the timing mat with a handful of stragglers at the end of the A corral and began ascending the first hill running the lines I wanted without having to jockey for position. And despite the hill, I kept the first mile around a 9:00 min/mile. So far, it was all going according to plan, and as we ran past the Soldiers’ and Sailors’ Arch and began the descent down Flatbush Avenue, everything started to look and feel familiar. And while I hadn’t really established a firm goal for the race, a 5K split of 27:22 positioned me for a sub-two finish, which would be perfectly acceptable. For the next few miles, it was all eerily like last years’ run — the cool crowds along Flatbush Avenue and outside the Barclay’s Center, the long ascent up onto the Manhattan Bridge, the beautiful view of the Brooklyn Bridge and the southern Manhattan skyscrapers in the golden morning sunshine. I allowed myself a little time to let it all sink in once again. The New York Half is truly one of the most beautiful races out there. I was brought down to earth around mile seven with another New York moment. Just as we were getting onto the FDR Drive, I spotted something gray in the roadway ahead of me. “Wait,” I said to myself. “That’s not a … oh, crap, yes it is,” I continued saying to myself while deftly stepping over a dead rat that was as big as house cat. It was New York moment number three. But the two “D’oh!” were just around the corner. Literally. As we made our way up the FDR Drive heading to the turn on 42nd St., I became aware of pressure building on the top of my feet. It was almost bad enough to make me think I had developed some kind of major muscle problem or, worse, a fracture. One step in every four or five had become intensely painful, and I had no idea why. Only after the race did I realize that I had never properly loosened the laces in the fairly new shoes I was running in. The pain continued on as we turned off 42nd St. and into Times Square, taking the edge of the fun moment that I had enjoyed so much in the previous years’ race. What was worse, I was now starting to feel fatigued, and even the boisterous crowds outside the bars on 7th Avenue getting their early St. Patty’s drink on didn’t seem to raise my spirits. Maybe it was the pain. Or maybe it was fatigue setting in. But it was at this point that my brain started playing tricks on me. As we passed Carnegie Hall, I was convinced we still had over three miles of Central Park hills to go, forgetting that the course had changed. I felt my body starting to give out, and I became seriously worried that I was going to have to walk the rest of the course. We passed the point we had entered the park the previous year, made a hard right onto Central Park South, and passed the 12-mile marker outside the Ritz Carlton hotel. Still, I just could not shake the thought that we still had all those hills to go. Even when we made a left into the Grand Army Plaza and entered the park itself, I was still convinced that I still had three miles of hills left to run. 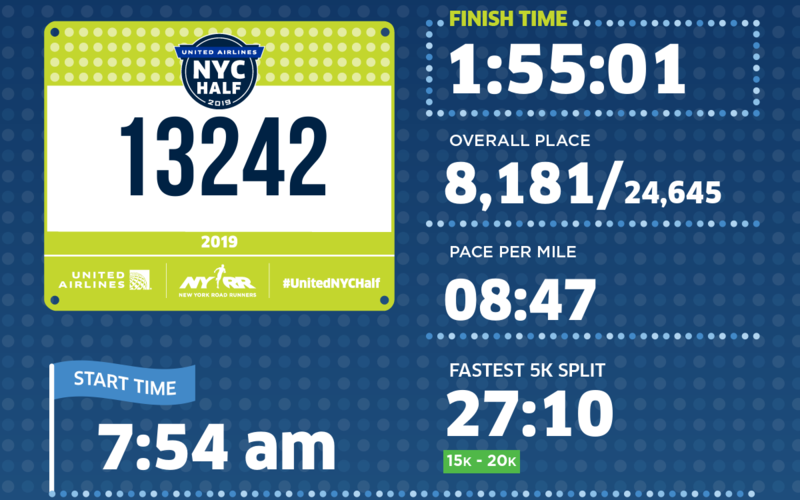 It was only when we reached the 13-mile marker around the Bethesda Fountain that my brain finally registered that there weren’t going to be any big hills to deal with — just one little incline prior to the finish line. With my feet still throbbing, I pumped my arms up in the air with relief as we crossed the line. My mind had turned to mush, but somehow my body’s automatic pilot had kicked in and I had made it though the last few miles. I had run slower than average pace to about mile three, average pace to about mile 9, and above average to finish. And that called for a celebratory beer and burger away from the St. Patty’s Day crazies in Midtown in a somewhat quieter Irish bar in Astoria later in the day. 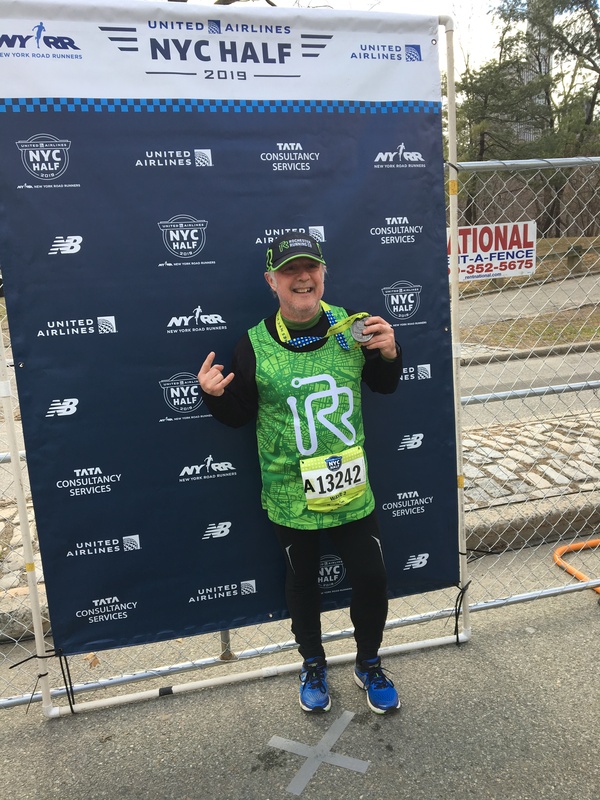 This entry was posted in #runstreak, The Flat-Footed Fox and tagged #runstreak, long-distance running, United Airlines New York City Half Marathon. Bookmark the permalink.